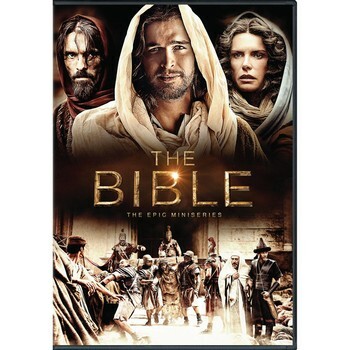 This is the third of a three part series on The History Channel’s The Bible miniseries*. You can find Part 1 here and Part 2 here. 5. The faulty theology of “The Bible’s” theological advisors is influencing and slanting the way God’s word is being presented. Rick Warren’s twisting of Scripture to fit his “Purpose Driven” overview of God’s nature and character, Joel Osteen’s self esteem boosting and positive thinking, T.D. Jakes’ prosperity gospel and modalism (an unbiblical doctrine of the Trinity), and Roma Downey’s New Age spiritual psychology degree have crept into The Bible’s stories and subtly shifted the Scriptures’ real focus on sinful man’s need of God’s redemption to a “follow the leader and together we’ll change the world” paradigm. Go back to the beginning of the series and watch it again, counting the number of times the word “leader” is used. Every major Old Testament character has been cast as a “leader,” and Israel’s prosperity or demise is portrayed as contingent on whether the leader was good or bad and whether or not Israel followed his leadership. This is not the message of God’s word. When Israel was obedient to God, she flourished. When she rebelled and chose idolatry, she crashed and burned. Kings, judges, and prophets had influence on the people, but it was Israel’s obedience to God Himself that was the hinge on which the nation swung. Further, nowhere in God’s word does it say that Jesus came to “change the world,” or “change people’s lives,” nor does the Bible teach that Christians are to do these things. Jesus came to seek and to save the lost (Luke 19:10), to serve, and give His life as a ransom for many (Mark 10:45). Christians are exhorted, not to the lofty goal of “changing the world,” but to the abasing role of denying ourselves, taking up our crosses daily (Luke 9:23), being persecuted (2 Tim. 3:12), and making disciples (Matt 28:19-20). Jesus did change the world, and He does change our lives, but this was a side effect of His life, death, and resurrection, not His goal. He was here to carry out God’s plan of redemption. The movie’s “change the world” mentality puts the focus on us. Scripture puts the focus on God’s sovereign redemptive purposes. From the beautiful picture of Jesus’ sacrificial death for us in the story of Abraham’s sacrifice of Isaac, to the overwhelming mercy and forgiveness of God after David’s sin with Bathsheba, to the awe-inspiring, God given faith in Shadrach, Meshach, and Abednego’s refusal to bow to an idol, the glory of God, which fairly drips from the Scriptures, is achingly absent from The Bible. To be fair, I don’t think any movie could ever completely capture the same revelation of God’s magnificence that a Christian experiences when he sits down and interacts with the Bible as the Holy Spirit moves in and among the living and active words. But there are movies that have come much closer than this one has. The Scriptures are not just a collection of stories meant to inspire us to emulate their heroes. Rather, they reveal to us who God is; a different facet of His glorious nature and character in each story we read. As I conclude these six observations about History’s The Bible, it is my hope and prayer that the overall effect of the series having been telecast will be a positive one for the Kingdom. For those of us who belong to Christ, may we use it as a springboard to share the gospel with the lost and encourage discernment and study of God’s word for our brothers and sisters in Christ and for ourselves. *Just a note for future readers: This article was written during the week between episodes 3 and 4 of the miniseries. Episode 3 wrapped up the Old Testament and introduced the New Testament, covering Jesus’ birth through the calling of Peter. As I write, I have not seen episode 4 or 5. This is the second of a three part series on The History Channel’s The Bible miniseries*. You can find Part 1 here and Part 3 here. 4. Does it really matter if “The Bible” is factually inaccurate and skips a lot of important stuff? It’s artistic license after all! Yes, it matters. And it matters on a lot of levels. In Scripture, when the Philistines wanted to bribe Delilah to betray Samson, they went to her (Judges 16:5). In the movie, the Philistines summoned Delilah to come to them. In Scripture, Daniel was cast into a pit or cave with lions, and a stone was rolled over the opening (Daniel 6:17). In the movie, Daniel was put into a dungeon with lions and a door was closed and locked behind him. In Scripture, it is clear that Sodom and Gomorrah were destroyed primarily for the sin of homosexuality (Jude 7). In the movie, homosexuality in Sodom and Gomorrah is not even hinted at. Now, if the movie makers can’t even get these simple details correct, can they be trusted to get the much more complex details of Jesus’ life, teachings, and propitiatory death and resurrection correct? As I said before, a lot of people won’t pick up their Bibles or have a Christian share the gospel with them after seeing the movie. What about them and the real Jesus they need for salvation? Second, the Bible isn’t just an anthology of short stories which are unrelated to one another. The Bible is one unified story—the story of God’s redemption of sinful man in the person of Jesus Christ. Every story, every incident, every jot and tittle of the Old Testament shows man’s need for redemption and points to the Redeemer to come: Christ. The gospels tell the story of Christ’s redemptive mission. Acts through Revelation point us back to the first coming of Christ and ahead to His second coming. When you omit or mangle any of the links in that chain, the story of redemption –the entire point of the Bible—breaks down, gets tarnished, gets lost in the shuffle. Why is that important? Because the Bible shows us our need of redemption from our sin. Our eternity depends on it. Finally, and most importantly, God’s word is high and holy, and it must be treated as such rather than playing fast and loose with it. He has preserved it through thousands of years and at the cost of many lives. God takes His word seriously, and so should we. 1. “The Bible” will get people to read their Bibles. I hope so. I really do, but I’m concerned. Have you ever watched the movie Braveheart? The Patriot? Gone with the Wind? (Ha. You thought I had a little Mel Gibson thing going there, didn’t you?) Upon finishing any of those movies, did you pick up a thick tome on William Wallace, the Revolutionary War, or the Civil War and give it a thorough reading from beginning to end? Or did you just take for granted that those movies accurately portrayed the way things transpired? I’ve seen all of those movies several times, and I’ll admit none of them have inspired me to read up on the historical events on which they’re based. I’m guessing that while there may be some who will be inspired by The Bible to pick up the Bible and read it, those numbers will be far more minuscule than we might hope. 2. “The Bible” will lead people to a saving knowledge of Christ. Nothing would make me happier. Really! However, consider the Christ this movie is presenting. If The Bible doesn’t present the true Christ of God’s word, then people will not be saved. They will be putting their faith (if it is even made clear to them from the movie that they must repent and put their faith in Christ and His payment for their sin) in a false Christ—an idol that is powerless to save anyone. Worse, for a person who puts his faith in a false Christ, it may inoculate him against hearing and accepting the truth of the gospel in the future. 3. “The Bible” can be used by Christians as a “conversation starter” for presenting the gospel to their unsaved friends. This is the best impact The Bible could possibly have. I truly hope it gets many lost people thinking about God and that God will put a Christian in their lives to tell them about Jesus. I would love to see Christians use this movie as an open door for sharing the gospel with the lost. May many who need Jesus come to Him for salvation as a result of seeing The Bible.